(Elizabethtown, Ky.—May 9, 2017) Statistics released by the Kentucky Tourism, Arts, and Heritage Cabinet show that the economic impact of Kentucky’s tourism and travel industry for 2016 was more than $14.5 billion, an increase of 5 percent over the previous year. 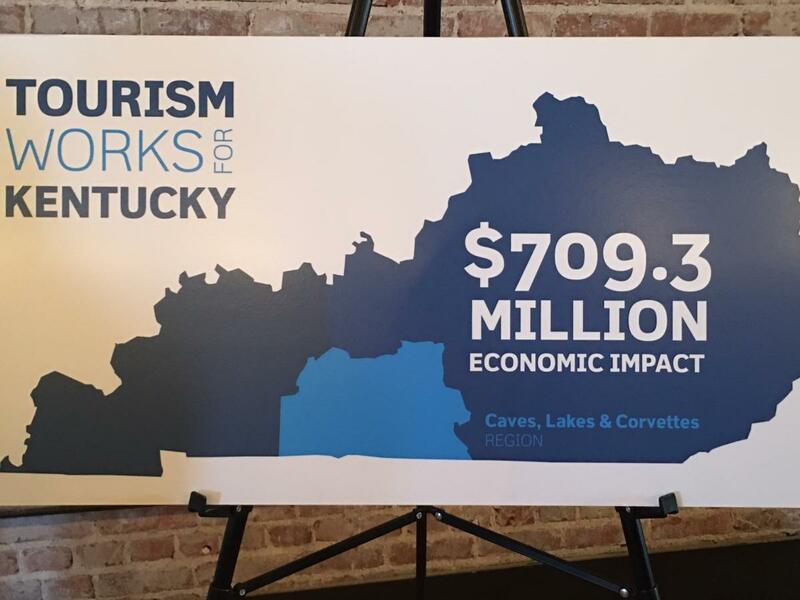 In 2016 Kentucky’s tourism industry generated over $1.5 billion in tax revenues to government with $195.1 million going directly to local communities. The industry supported nearly 193,000 jobs in Kentucky in 2016. These jobs generated more than $3.2 billion in wages for Kentucky workers, an increase of $156 million from 2015. All nine tourism regions showed gains for 2016. Hardin County is included in the largest of the nine regions, which is named the Bourbon, Horses, and History region. The direct economic impact for tourism in Hardin County was up by 4.6 percent in 2016 compared to 2015. Hardin County surpassed Paducah/McCracken County’s impact figures for the first time and is now ranked the sixth highest income-producing county in the state in direct visitor spending. Hardin County had been ranked seventh since surpassing Owensboro/Daviess County in 2010. Local tourism impact was $228,893,932 in direct expenditures in 2016. 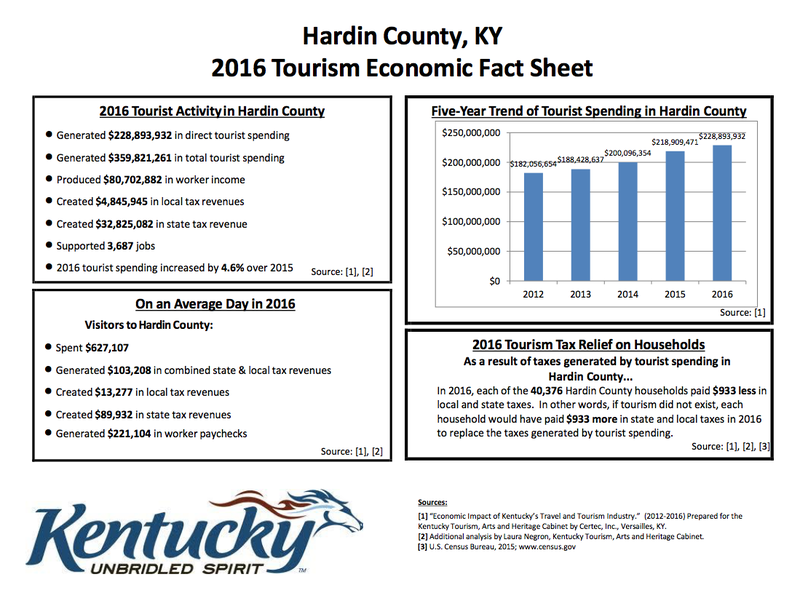 Hardin County’s tourism industry increased over $12.5 million in expenditures over 2015. “To advance in the rankings is such a great accomplishment for our area. Paducah is a large community with so much to offer visitors, but as the figures show, Hardin County is developing at great pace. We are very fortunate to have two tourism commissions in Hardin County that work together to provide a quality destination experience, which in turn, increases visitor spending. Our local industry must continue planning for the future by growing and expanding our tourism offerings. There is still so much that can be done,” said Sherry Murphy, Executive Director of the Elizabethtown Tourism and Convention Bureau. "I am thrilled that we are now the sixth most visited county of the 120 counties in Kentucky in terms of visitor spending. It is quite an accomplishment to be among the top 10 income producing counties in the state,” said Kelly Barron, Executive Director of Radcliff/Fort Knox Convention & Tourism Commission. The Kentucky Department of Tourism continues to build upon Kentucky&apos;s signature tourism industries of horses, bourbon, music, arts, outdoors and culinary to reach new audiences and present Kentucky as a top- level destination for visitors internationally and domestically.